An amazing giant heirloom sunflower with enormous blooms, up to a foot across. The large yellow flowers with brown centers top plants 9-12 feet tall and yield heavy loads of seeds. 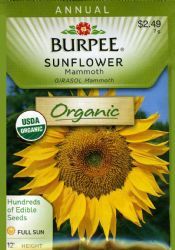 Fast and easy to grow, Mammoth sunflowers are great for creating a Sunforest for kids, a tall annual hedge or screen. Sow in the spring after the last average frost date. When around 3" tall, seedlings should be thinned to 2 feet apart. Edible seeds attract birds and make great snacks. 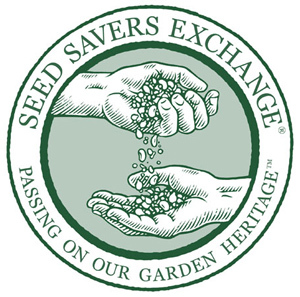 To save seeds, cut the flower heads with a piece of stem when the backs turn yellow. Hang upside down and let dry in a cool, dry place for about a month. Cover with netting or paper sacks with holes to keep seeds from falling. 100 days. Certified Organic.